Hartford Healthcare’s Bone & Joint Institute, centrally located at Hartford Hospital, offers a patient-centered approach in providing innovative musculoskeletal care, from diagnosis to treatment and rehabilitation. Their extensive network of coordinated services provides decades of experience to patients in this state-of-the-art facility. OFI furnished a number of spaces including offices, lecture halls, training rooms and common areas - indoor and outdoor. Working with architectural firm BDH, OFI’s team of experienced professionals addressed concerns of functional office space for doctors as well as comfortable waiting spaces for patients and their families. Product from Herman Miller and over 20 other manufacturers was carefully chosen and thoughtfully placed throughout the Institute. 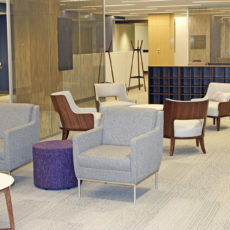 The Bone & Joint Institute is just the latest project in a longstanding relationship OFI has with Hartford Healthcare.